A pocket guide with everything you need to know to enjoy sushi at a restaurant or at home. Sushi is one of the most popular foods in the world. But sushi lovers know there’s more to learn beyond the spicy tuna, salmon avocado, and California maki roll lunch special at your local restaurant. This staple of the Japanese diet has been perfected by sushi chefs for hundreds of years. Each component—from the fish and the rice to the nori, vegetables, wasabi, and soy sauce—works in perfect harmony to create a single bite of pure pleasure. But sushi can also be intimidating. Where does the fish come from? Are there seasons for sushi fish? What does omakase mean? And how do you make sushi at home? Within the pages of this pocket-sized guide, you’ll find information, how-tos, and trivia for sushi lovers at all levels. Experts and newbies alike will learn: • Types of Sushi Fish and Their Origins • The Importance of Sushi Rice • Sushi Etiquette • 10 Ways to Expand Your Palate • How to Slice Fish • And more! 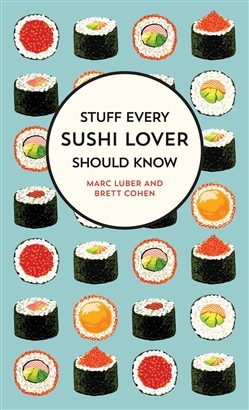 Acquista Stuff Every Sushi Lover Should Know in Epub: dopo aver letto l’ebook Stuff Every Sushi Lover Should Know di Brett Cohen, Marc Luber ti invitiamo a lasciarci una Recensione qui sotto: sarà utile agli utenti che non abbiano ancora letto questo libro e che vogliano avere delle opinioni altrui. L’opinione su di un libro è molto soggettiva e per questo leggere eventuali recensioni negative non ci dovrà frenare dall’acquisto, anzi dovrà spingerci ad acquistare il libro in fretta per poter dire la nostra ed eventualmente smentire quanto commentato da altri, contribuendo ad arricchire più possibile i commenti e dare sempre più spunti di confronto al pubblico online.